Written by admin on October 12th, 2014 . Great spot for lunch at horse farm. 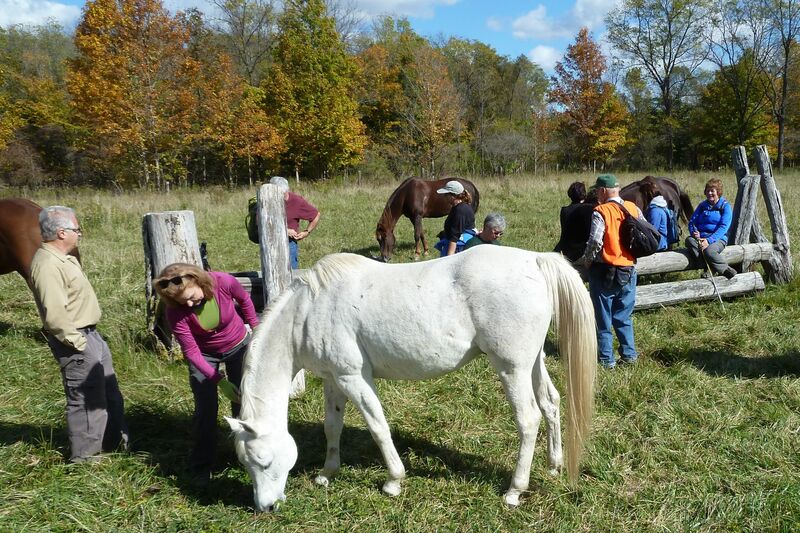 The horses could smell everyones apples and came over for a chomp and visit. to see deer in several locations. Great colours but not a lot of flaming reds. We had another great day for weather, started off cold but warmed up nicely. Written by admin on August 5th, 2014 . 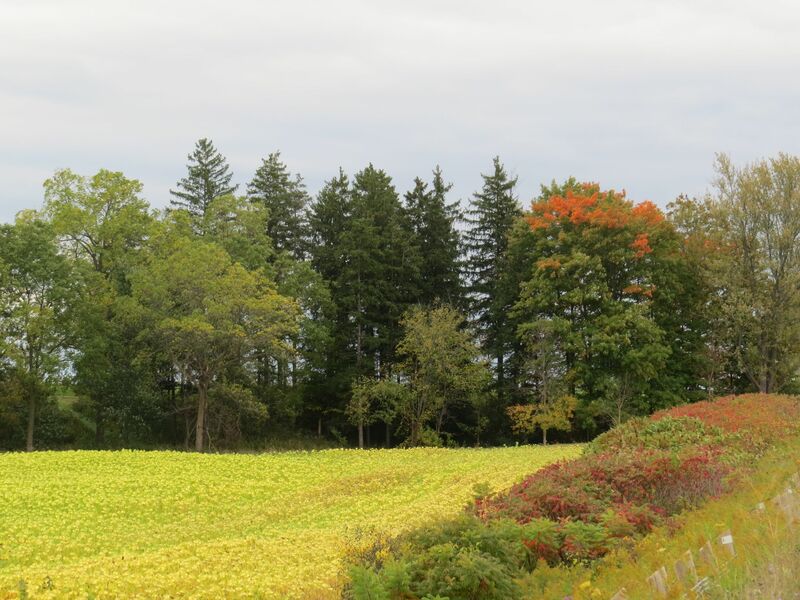 Sept.6th This year the Bus/Hike will be on the Maitland trail near Goderich and follows in sections along the meandering Maitland River. We will be hiking sections of the trial that had major devastation damage due to the tornado in August 2011. 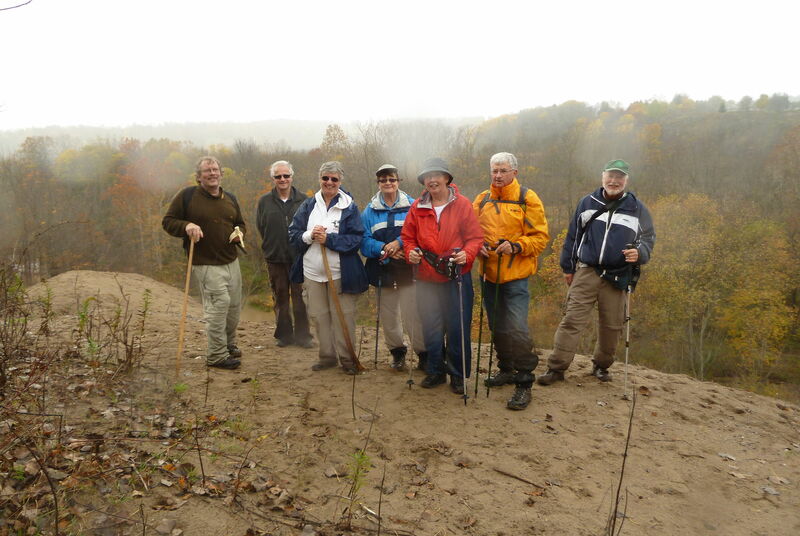 An amazing job to reopen the trail was done with the help of many volunteers from different hiking clubs. We offer two walks for the day. Hike #1: 16.5km Faster pace – longer hike will start at 3.5km on Map 1 following the white main trail to the end at 19km on Map 2 near Benmiller. This hike starts with road walking, in and out of the woods until entering the woods again at 7.8km. Here the trail begins to get steep in sections. Hike #2: 10.5km Moderate pace – shorter hike will start at 7.8km on Map 2 following both the white main trail and some of the blue trail. Here the trail begins to get steep in sections. Hike #2 also will ends at 19km near Benmiller. To save a seat on the bus, all hikers are to register by email “pat-tilman@rogers.com.” Once hikers are registered Pat will send information on where to send “cheques for $30 made out to the TVTA” and pick up location. Payment is non-refundable and non-transferable. Payment is necessary to save a seat. There will be two pick up spots. One in Kitchener at 7 am the other in London at 8 am. After the Hike: The plan is to be on the bus and moving by 2:15 pm with a stop at Boston Pizza in Goderich for drinks and some food before heading back by 4 pm. Each hiker is to pay for their own drinks and food. ON THE HIKE: Bring water, snacks and a lunch. Poles and hiking boots are recommended. Dress for the weather. NOTE: Items and a change of footwear and clothes can be left on the bus. This is a great opportunity to meet like minded people from area clubs, hope to see you there. Written by admin on July 6th, 2014 . One no longer needs a day permit to walk these wonderful trails and Union Pond. This is a loop trail that meanders around 25 hectares of provincially significant wetlands. The trail can be accessed through the Dalewood campground or at the public parking lot immediately across from the Dalewood dam. Located just outside of the city of St Thomas the trail is easily incorporated into a day trip or into a weekly exercise routine. Bird enthusiasts will appreciate the vistas overlooking the wetlands. Cormorants, great blue herons and occasional bald eagles can be seen here. This trail connects the Dan Patterson trail to the Dalewood reservoir trail. This robust trail, which includes some hills, will take the more avid hiker into the heart of Kettle Creek’s wild valley lands. Hikers will be treated to vistas of lands hardly touched by urbanization and may be afforded the opportunity to see an array of song birds, beavers, and great blue herons. Nestled in the Kettle Creek valley lands, the Dan Patterson walking trail is close to home, but far enough to escape city life. 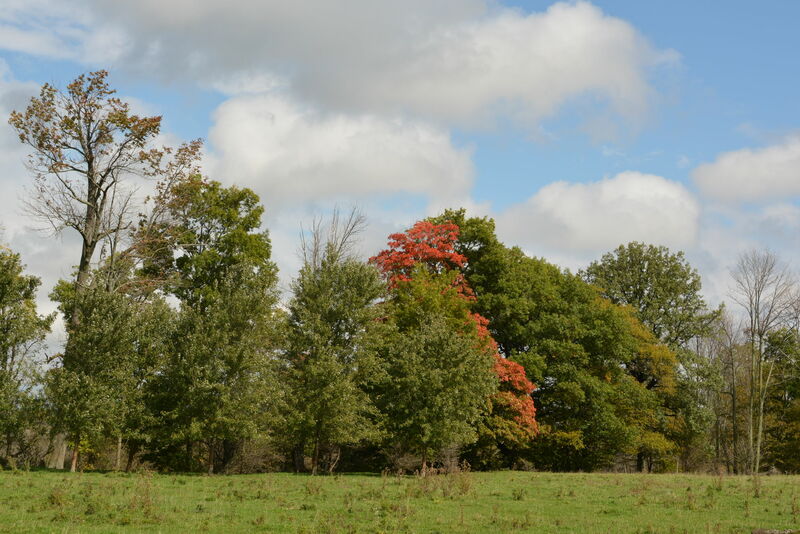 The walking trail starts at the Dan Patterson conservation area, which is a popular picnic spot complete with a playground, pavilion and splendid shade trees. For history enthusiasts, the site is also home to a restored log cabin. The cabin was originally the home of Alexander Patterson, who emigrated from Scotland in 1834. A replica water tower and windmill have also been restored on this site. Written by admin on February 21st, 2014 . 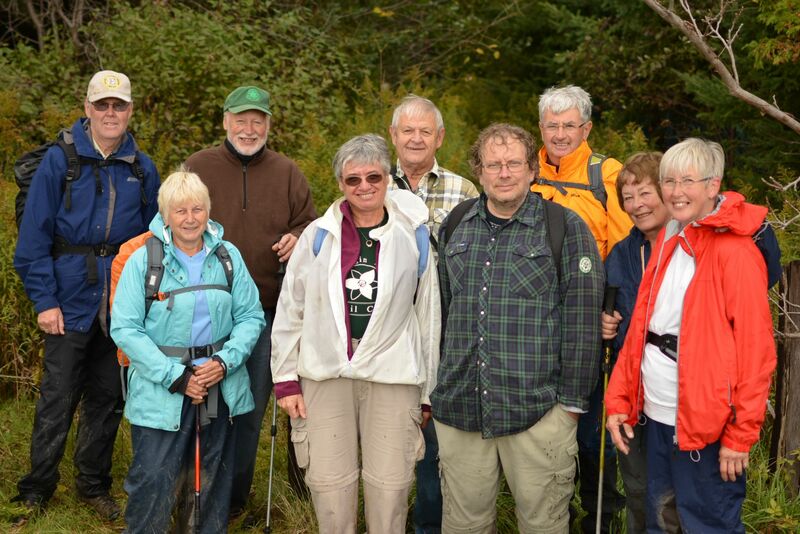 The annual general meeting of the Elgin Hiking Trail Club will be on Tuesday, April 15th at the Carnegie room of the St Thomas Public Library. Doors open at 6:30 pm and the meeting starts at 7:00 pm. Please renew your membership at the meeting. Open to the public. Our guest speaker will be Doris Miller and she will be talking on the state ferries en route North to Alaska.